When the Eagles lost to the Vikings on Tuesday night the season finale between Dallas and Philadelphia essentially became a meaningless game. Philadelphia is locked into the #3 seed in the NFC no matter the outcome of their game with the Cowboys on Sunday. Think back to the season finale a year ago and you can see just how far the Cowboys have fallen in 12 months. So what is left to watch for on Sunday? First and most importantly in my mind is how the Cowboys approach the game. I'm talking about attitude and focus. The focus should have already started now if Jason Garrett is doing his job. But you can always tell how a team has prepared throughout the week by how they perform on the field. If the Cowboys come out fired up and scratch and claw for four quarters like they have for the last seven games then you know that Jason Garrett found a way to motivate his team for a glorified pre-season game. Although I still believe that Jerry Jones has already decided to keep Jason Garrett permanently Garrett needs to keep the team playing hard and focused to win over his critics. And there are still a lot of them. It would be hard to argue with a 5-3 finish down the stretch with a team with nothing to play for facing what was probably the most difficult schedule in the NFL. Stephen McGee will get his shot to prove that the Cardinal game was no fluke. The Cowboys really need to know if McGee can be a long term answer at backup quarterback. I'm sure he will still be given a scaled back game plan but he still needs to play within himself and execute the plays he is given. Jason Witten has a shot at 100 receptions on the year. I know the old saying is statistics are for losers. Well, the Cowboys are losers this year. So I am worried about statistics. 100 receptions for a tight end is a rare feat. With 10 catches on Sunday Witten will reach that mile stone. I would love to see him add that item to his ever-growing hall of fame resume. You might be watching several players for the last time in a Cowboys uniform. I mean guys like Marion Barber, Leonard Davis, Roy Williams, Alan Ball, Gerald Sensabaugh, David Beuhler, and several others. I'm not saying that none of these players will be back next year. Many of them will be here in 2011. But you can be sure that at least a few of them won't be on the roster next season. I would like to say I want to see improvement from the defense but is there really a reason for that at this point in the season? We all know there will be new players and probably a new 3-4 philosophy next season so it is hard to get excited for the defense. But you still have to hope for a solid performance by the defense because the Cowboys have no chance if Vick plays the whole game and the defense lays down. I really hope DeSean Jackson doesn't sit out the game. I would love to see someone on the defense or the punt coverage team light him up. Jackson's antics have crossed the line on multiple occasions in his short career. Maybe someone can finally put him in his place. There is a good chance the Eagles will be sitting a lot of their key players or at least limiting the playing time of their starters. I don't expect the Cowboys to follow suit. If the Eagles roll out a team of backups then a loss would be an embarrassment for the Cowboys. But I just can't see the Cowboys laying down now that Jason Garrett is in command. When all is said and done I expect the Cowboys to win. Not because I believe they are the better team. I think they'll win because the Eagles are going to be shutting it down at some point in the game. The playing time for most of the Eagles key starters will be limited at best. And many of the Cowboys are playing for their spot on the team next season. I predict a 24-14 victory for the Cowboys. In yet another freakish game this season the Cowboys lost thanks to a missed extra point and another last minute defensive breakdown. It feels like the end can't come quickly enough. While the Cowboys are playing with a lot more heart and intensity under Jason Garrett there are just too many holes in the roster right now to overcome. There are clearly going to have to be some big roster moves made in the offseason and Jerry Jones has a big decision to make about Jason Garrett. The offensive line is obviously a problem. The free safety position is a joke. The middle linebackers have become old and slow. And Terence Newman's age at cornerback has to be a concern as does the poor play of Mike Jenkins. Do I even need to mention kicker? I still believe that Jason Garrett is the man for the job as head coach. I realize that the deficit they found themselves in against the Cardinals came with him coaching. But his team fought and clawed their way back into the game even playing with their third string quarterback playing for the first time in his NFL career after Kitna went down. And keep in mind that McGee essentially had no practice reps all season long. Garrett had to adjust the entire offense on the fly to allow McGee to be successful in the game. With a full offseason I believe Jason Garrett could complete the transformation of the Cowboys back into a contender. Stephen McGee will probably get a shot to earn his spot on the roster next season. And it will be important for the Cowboys to know what they have in McGee because it makes a big impact on their draft plans in the offseason. If McGee can show more promise like he did against the Cardinals then the Cowboys may have their long term solution at backup quarterback. They will still need to find a future starter but they can afford to wait a few more years on that with Romo only 30 right now. The worst part about this season is how numb I have become to the devastating, last minute losses. The more the Cowboys lose the easier it is to take because my expectations have been lowered so far from where they were at the start of the season. But that doesn't mean I won't expect more from the Cowboys next season. I know Jerry Jones is committed to putting a winner on the field but he obviously needs to re-evaluate many of the roster decisions he has made over the last few years. A lot of guys won't be back next season. There have to be big changes if there will be any hope of being competitive next year. The Cardinal game was just a reminder of how much work the Cowboys will have to do in the offseason. It is finally official. Tony Romo won't be coming back for either of the two remaining games on the schedule. It really isn't much of a surprise at this point. 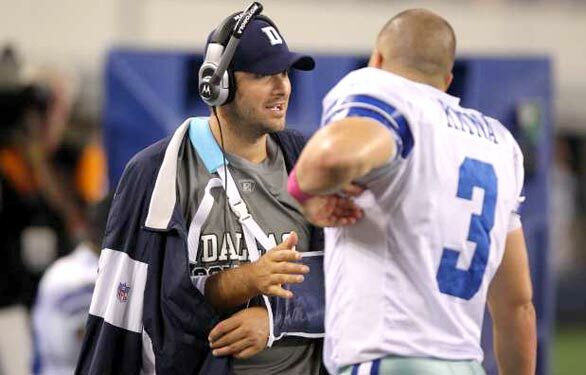 When Romo failed to return to practice over the last two weeks the writing was on the wall. At this point there just isn't enough time for him to practice and work himself back into game shape. Tony needs to get himself healthy and come back to offseason workouts in great shape. I was hoping to see Romo for at least a game or two down the stretch even if the games are meaningless. But if he isn't healthy, he isn't healthy. There is no arguing with that. You can't risk your franchise quarterback in two essentially meaningless games if you aren't certain he is coming back at 100%. I have no doubt he would be out there if these last two games had playoff implications. What I was happy to hear is that Romo will be traveling with the team. He has been functioning as an extra coach on the sidelines over the last two months. The people who question his leadership qualities need to watch him function on the sidelines during the games. Tony has been helping Kitna, the offensive line, the receivers, the running backs and even some of the defensive players. He may not be out on the field but he has plenty of experience that allows him to see some things that the coaches may not see on the field. It is depressing to think that we will have to wait until next season to see Romo out there leading the offense again. I can only hope that absence will make the heart grow fonder for all of the Romo haters out there. Like I've said before, Kitna has done an admirable job filling in for Romo. But the offense has lost much of its explosiveness without Romo running the show. I have no doubt Romo will be at the top of his game to start the season next year. The Cowboys need him if they have any hope of getting back to the playoffs next season. It looked for the first two and a half quarters that the Redskins were completely over matched against the Cowboys. The Cowboys took a 27-7 lead and I think everyone expected the Redskins to roll over and give up. But they obviously did not. The Cowboys defense went soft and allowed the Redskins to slowly work their way back into the game and tie it up at 30-30 with about 6 minutes to play. Fortunately the Cowboys pulled out the victory on the second game winner in the last two weeks for David Buehler. The game had a lot of ups and downs for the Cowboys. On the one hand the running game was actually pretty good. I say that but then in the next breath I have to mention that the running game was stuffed repeatedly on the goal line in yet another game. The passing game was good (Kitna threw for over 300 yards) but the offense disappeared for about a quarter while the Redskins played their way back into the game. Jason Witten was a beast once again and proved why he is the best tight end in the game right now. The defense came up with two turnovers and kept the Redskins in check for the first two and a half quarters. But then they reverted to their typical form and allowed the Redskins to go up and down the field at will...with Rex Grossman at quarterback! Then, when all seemed lost, they came up with back to back sacks to give the ball back to the offense with the game tied at 30-30. Like I said, it was an up and down day. The special teams did a very good job for the most part. David Beuhler was 4 for 5 on field goals and hit the game winner with 50 seconds on the clock from 39 yards out. And his kickoffs were pretty good for the most part. But he shanked a field goal at the end of the half that would have given the Cowboys a 23-7 halftime lead. Again, and up and down kind of day. The good news is that the Cowboys managed to finish on an up in all three phases of the game. The defense stepped up and made plays when it was needed the most. Matt McBriar pinned the Redskins near their own goal line with the game tied. The offense put the ball in position for Beuhler to hit the game winner. And Buehler came through on the field goal with the game on the line. Terence Newman even made a nice play to end the game with an interception. Let's not fool ourselves here. It was nice that the Cowboys came away with the win. I can guarantee that the Cowboys would have lost that game early in the season. But there are major problems with the offensive line and the secondary. Losing a 20 point lead is nothing to be proud of. But at least the players were resilient enough to overcome the momentum of a 20 point comeback by the Redskins. A reporter asked Jason Garrett if his head coaching future with the Dallas Cowboys flashed before his eyes as the Redskins erased the 20 point deficit. He hesitated, smiled, and said he lives in the present. But you have to believe that he could have easily lost his shot at the head coaching job if the team had collapsed and lost that game. On the positive side the Cowboys overcame a lot in this game. They won with their backup quarterback. They were missing two of their top three receivers. They lost their starting strong safety during the game. Sean Lee was out for most of the game with a concussion. And the list goes on and on. But they still prevailed. It is important to remember how important it is that the Cowboys start finding a way to win close games. No one wants to hear about their excuses. We all just want to see a win at the end of the day. And that happened so you have to be happy on some level with the outcome. Jason Garrett has a lot of work to do after this game. Penalties were a problem. The defense was horrible for a quarter and a half. Some of the offensive play calling was questionable at best. Their were several coverage breakdowns in the secondary. And the run defense was soft up the middle again. But I liked his Garrett's response to adversity. I have to believe he had a few choice words for his team at half time due to the sloppy play of the Cowboys. And I liked how he showed some emotion when Beuhler hit the game winner and tried to fire up Demarcus Ware to shut down the Redskins on their last ditch drive. At the end of the day he is 4-2 as a head coach of a team playing with its backup quarterback. The head coaching job is Garrett's to lose now. The positive vibes that have been around Valley Ranch since Jason Garrett took over have taken a bit of a hit after the loss to the Eagles. The early success that Garrett had as the head coach has raised the level of expectations for the team again. Putting up a good fight was acceptable for a short time after the embarrassment of losing 45-7 against Green Bay. But now that Garrett has the team showing signs that they can be a winning team again, close losses are no longer good enough. I think the Cowboys are on the verge of not only winning, but dominating inferior opponents like they should have all season long. I know Jon Kitna is handcuffing the offense in some ways. I know the defense is still terrible. But the Cowboys have eliminated a lot of the problems that plagued them in the first half of the season. Penalties and turnovers are down. Forced turnovers have increased dramatically. But the Cowboys still haven't turned the corner when it comes to winning close games down the stretch. The New Orleans game should have been a win. And the Philadelphia game was tied in the 4th quarter. This team needs to start winning close games consistently if they are going to be able to win on a regular basis. With the Redskins up next on the schedule it sure seems like this is a game the Cowboys can and should win. The Redskins are on the verge of completely collapsing. Donovan McNabb might not even start this week and, if he does, he could be benched at any moment during the game. Albert Haynesworth has been sent home for the season after one of the biggest free agent signing mistakes of all time. I am certain the Cowboys will come out on top this week. Up next after the Redskins are the Cardinals on Christmas Day. The Cardinals are also a mess right now. They are scrambling to find someone, anyone to play a decent game at quarterback for them. And their defense has lost nearly all of the great players that sparked their improbable Super Bowl run two years ago. The Cowboys will win in convincing fashion and head into the season finale against the Eagles on a hot streak. There is a chance that the Cowboys could have an opportunity to delivery the kill shot to the playoff hopes of the Eagles depending on how the next two weeks play out. But either way the Cowboys have to believe that the coverage mistakes they made on a handful of plays in the first game can be corrected. If Jenkins doesn't try to jump the route on the 91 yard touchdown by DeSean Jackson there is a very good chance that the Cowboys would have won. And I think they will make the necessary adjustments to insure that we won't see another sickening touchdown "celebration" by DeSean Jackson. I believe the Cowboys will win the game with or without Tony Romo this time around. If this scenario plays out we are looking at the Cowboys finishing the season at 7-9. Shameful, but after starting 1-7 and playing without Tony Romo for most of the season you would have to admit that 7-9 was a good outcome after a bad start. I really hope we see Romo on the field for the last two games but it is starting to look less likely as he is making a slow recovery from his broken collarbone. A 6-2 finish would prove that we don't need to completely blow up the team in the offseason and start over. And it would give hope that the Cowboys can return to the playoffs next season. - Michael Vick is very tough to defend. But I think the Cowboys did a decent job containing him. Unfortunately the secondary had three big break downs in coverage against DeSean Jackson and it cost them the game. But I loved the way the pass rushers were getting after Vick and delivering some punishment to him when they got there. - Jon Kitna has performed excellent for a backup quarterback but the offense really needed Romo last night. I have been noticing for several weeks that Kitna has several holes in his game that are now starting to get exposed. He was allowing the Philadelphia defense to dictate the plays last night by checking down to the safety valve nearly every time they sent the blitz. You have to give your guys a shot down the field when they are one on one or the defense will feel safe to crowd the line and send extra rushers all game long. And as soon as Kitna is on the move you know it is pretty much a dead play if he throws on the run. Romo makes his biggest plays when he is on the move. - I don't know why it keeps happening but Kitna must get 3 or 4 passes batted down every game. Either he isn't finding the windows to throw through like he should be or he is the unluckiest guy in the world. - Kitna has to be one of the worst quarterbacks I have ever seen running the two minute offense. The poor clock management in the two minute drill has cost the Cowboys in the last two games. It seems as though part of the reason they are working so slow is due to the game plan of Jason Garrett. Maybe he doesn't trust Kitna to run the two minute offense like he does Romo. - I don't want to sound like I am blaming the whole game on Kitna. I am not. He has been better than you could ever hope for your backup quarterback to play. But the people who are actually making the comments about Kitna being better than Romo need a reality check. - I know I am biased, but Jason Witten is by far the best tight end in the NFL. Tony Gonzalez and Antonio Gates are great receivers but Witten is a leader, is a very good blocker and is also a great receiver. It has gone largely unnoticed, but Witten has really become a vocal leader on the sidelines this season. - I like the way the team fights but close losses are no longer good enough. I know the Cowboys are playing without their best two offensive players but you have to win the game when you are close in the 4th quarter if you want to be a good team. The defense and the offense both broke down last night at a crucial point in the game. DeSean Jackson had the 91 yard touchdown and Kitna followed that up with an interception on a bad read on his part. - David Buehler might actually be improving. He still ranks near the bottom of the league in field goal percentage, but the last two games have been very good. Maybe the game winner he hit in overtime against the Colts will be the spark he needed to gain confidence and consistency. - The Cowboys still have major problems on the offensive line. The running game was awful last night which resulted in a lot of third and long situations. I don't know why the line has so much trouble opening up running lanes but the line clearly needs to be fixed in the offseason. - DeSean Jackson is a complete idiot. The falling backwards into the endzone was completely classless but I really expect it from him at this point. What was more ridiculous was his behavior during the post game interview on NBC. And I thought Martellus Bennett was bad. DeSean Jackson redefines the word immature for me. - The whole Tashard Choice getting Michael Vick's autograph is being completely overblown. I don't know why anyone would want to get the autograph of a guy like Vick. We're talking about a guy who flipped off his home crowd in Atlanta, got caught with marijuana at the airport, was involved in dogfighting and brutally killing dogs, and was such a class act after getting out of prison that he was in the middle of a shooting investigation because he can't stop hanging around the crowd that got him in trouble to begin with. And now we are all supposed to forgive and forget and move on? Sorry but I can't. I can't for the life of me understand how Tashard Choice would want his nephew to use Michael Vick as a role model. Get the kid Demarcus Ware's autograph. Get him Jason Witten's autograph. But a guy like Vick? I will never understand that one. But asking the guy for an autograph is fine if you really think that on the field after the game is the time and place to get it. With the Eagles coming to town Sunday night the Cowboys will have their work cut out for them this week. Last year the Cowboys dominated the Eagles and were able to shut down the Eagle offensive attack with ease. But it will be much more difficult this year now that Vick has reverted to his pre-prison form. The task on Sunday night will be to contain Michael Vick. So the big puzzle the Cowboys will have to solve is how to deal with the unique skill set that Vick brings to the quarterback position. They can't sit back in their zone coverage like they have been regularly over the last few weeks or Vick is going to beat them running or throwing the ball deep because he'll have time to wait for his speedy receivers to get behind the defense. They can't blitz every down or Vick will kill them with his legs if the blitzers don't come up with the sack. And blitzing typically leaves your secondary at a disadvantage if you can't get to the quarterback and disrupt his passes. So what should the Cowboys do to stop Vick? I think defenses have started to show the Cowboys a winning game plan over the last few weeks. There are several things that have to be done on defense to slow down the Eagle attack. 1. Get pressure on the quarterback without sending extra defenders. I'm not just talking about Demarcus Ware and Anthony Spencer here either. It is important to get pressure on the quarterback from all angles with Vick so he doesn't have room to escape and run wild. So Jay Ratliff, Jason Hatcher, Igor Olshansky and Stephen Bowen all need to put pressure on Vick on a regular basis. 2. Force Vick to scramble to his right. When Vick rolls to his left he can still throw with great accuracy. But when he has to move to the right he is forced to throw across his body and his poor fundamentals get exposed. That means it is vitally important that Demarcus Ware does not lose contain on his rush. 3. Don't let Jeremy Maclin or DeSean Jackson get open deep. Vick has a tendency to wait for the big play to develop even when there are receivers open underneath. As long as the secondary can protect against the deep ball it will keep Vick waiting in the pocket and give the pass rush a better shot at a sack. 4. Don't let the Eagle running game become a factor. You can successfully stop Vick if the entire defense is able to focus on just Vick. But if the Eagles run the ball successfully the defensive line and outside linebackers suddenly have to worry about the run first so Vick will have more time to slice up the defense. 5. Allow Sean Lee to spy Vick in some situations. I don't think you can use a defender on every play to focus only on Vick. But in situations where you know Vick is likely to run it would be a wise move to devote a defender to spying Vick. When the Cowboys beat the Falcons in 2006 with Vick at quarterback Bobby Carpenter was able to contain Vick's running because he was able to just focus on Vick. I believe Sean Lee is faster and more athletic than Carpenter so he could be successful in the same role on the defense. Carpenter came up with one and a half sacks in the spy role and we all know that Lee is a far superior player to what Carpenter will ever be. This is going to be a tough game for the Cowboys even if they can minimize the damage that Vick does in the game. Losing Dez Bryant changes a lot of things on the offensive side of the ball because defenses were committing extra defenders to Dez. The offense will need to run the ball consistently and score some points because the Eagles will score even if the defense plays well throughout the game. I don't have the best feeling about this game based on the way the defense has been struggling this year. But the Cowboys are rolling now so I can't pick against them. I think the game will be a hard fought battle but I am picking the Cowboys to win 28-24. We have seen the new version of the Cowboys for a full four games now and it is pretty apparent that a lot of things have changed with the team. Some of the changes have been about attitude. Some have been scheme. There have been changes to practice habits. And some have involved playing time for young players. The common denominator in all of this has been Jason Garrett. While I realize that there are still a lot of doubters out there, Jason Garrett is clearly on a path to become the permanent head coach of the Dallas Cowboys. You can't totally blame the people still questioning Garrett since he was the offensive coordinator that helped lead the Cowboys to a 1-7 start. But since he has taken over control of the team there have been a lot of obvious changes for the better. Let's start with the overall attitude of the team. There has been a positive vibe coming from the team from the moment Garrett took over. He speaks with confidence and he demands results from his players. The message that he consistently preaches of "be great today" sets a tone and it really is what Garrett is all about. The lazy, half-hearted practices and meetings are no longer being tolerated. There is a constant reminder to be great throughout the week and, if the Cowboys can put together a good week of practice, you should see good results on game day. So far the message has proven to be true. The defensive players that didn't know what to make of Garrett at the beginning have bought in because they can see that the message proves true game after game. From a scheme standpoint a lot of things have changed in all three phases of the game. On offense, there has been clear change to emphasize the running game since the debacle against the Packers. Some delusional people have suggested the changes in the offensive game plan came because Garrett was trying to get Wade Phillips fired. That is so ridiculous it really isn't worth addressing but my answer to that is the thing that got Wade fired was the embarrassing play of the defense and it had very little to do with the offense. Garrett surely saw as we all did that the passing game with Kitna had to be scaled back because he was struggling to make all of the reads and throws required with the game plan due to poor offensive line play and, frankly, inferior talent to Romo. On defense it is obvious that Paul Pasqualoni has switched the scheme from a blitz heavy, man coverage scheme to a base 3-4, zone coverage scheme. The defense hasn't improved much statistically in terms of yards allowed and points allowed but there has been a huge shift in the defense's ability to force turnovers. With the defense now coming up with interceptions on a regular basis the offense hasn't been forced to go 80 yards to score every time they get the ball. And the defense is even putting points on the board to make a big impact in the outcome of the games. The defense still needs a lot of work, but again, when you lose 45-7 it is time to re-evaluate how you are playing and make some changes. Special teams has been consistently inconsistent all year long. But it seems like Joe DeCamillis has finally decided to let David Buehler start booming kickoffs as far as he can like last year. And the result has been a vastly improved kickoff coverage team because they aren't forced to stop a returner nearly as often. Matt McBriar should be a pro bowler with his superior play and his 65 yard overtime punt against the Colts was a bigger play than most people noticed. The return game is still very inconsistent, but Bryan McCann and Dez Bryant have give both return units big plays. Buehler's field goal percentage is near the bottom of the entire NFL, but the sad part is that he actually has hit a better percentage than they guy he replaced, Nick Folk. The change to full pad practice on Wednesdays seems to have sparked the running game on offense. The offensive line seems to be improving week by week and it is exciting to think how the Cowboys will be running the ball by the time we get to the last game of the season. Along with the offensive line I think the full pads practice has helped the defense improve their tackling and aggressiveness. Getting some of the young players on the field has happened partially by choice and some have been forced on the field due to injuries. Bryan McCann, Sean Lee, and Tashard Choice have all made major impacts in the last four games. And the coaches should stick with these guys down the stretch since they have proven they deserve a shot. I am really excited by what Sean Lee is turning into now that he has a good grasp of the defense and the speed of the game at the NFL level. It will be hard to keep him off the field if he keeps making big plays. And I'll bet Marion Barber is very nervous about his playing time. If Choice keeps playing like he did against the Colts it would appear that Barber's days in Dallas are numbered. If you think about the roster a big part of the problem this season has been work ethic. Players who were on the team when Parcells was around developed some great work habits that survived even through the laid back approach of Wade Phillips. I'm talking about guys like Jason Witten, Miles Austin, Terence Newman, Demarcus Ware, Tony Romo and Bradie James. I never had a doubt about whether they would be ready to play even with Phillips running the team. But players like Mike Jenkins, Orlando Scandrick, Martellus Bennett, and Anthony Spencer have never had a head coach demand the best they have every day since they entered the NFL. I think they are all benefiting from the new approach that Garrett has brought to the team. After watching the Cowboys stumble to a 1-7 start it sure is fun to watch them put things together and start winning again. They beat Peyton Manning and the Colts Sunday night on an overtime field goal by David Buehler. 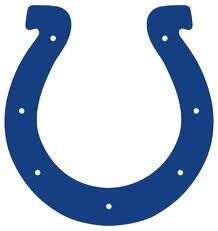 And what made the win really impressive is that the game was on the road and the Colts were in desperation mode. Sure, Peyton Manning was the best player the Cowboys had but the Cowboys made the big plays in the big moments to win the game. If you aren't sold on Jason Garrett as the head coach I'm not quite sure what it is going to take to convince you that he is the real deal. We just saw the team that lost to Green Bay 45-7 just four weeks ago beat the Colts on the road without Tony Romo running the offense. And they have now won three out of four games since Garrett took over with two of those wins coming against probable playoff teams. And it isn't like the Saints beat them by much either in Garrett's only loss as a head coach. The most impressive part of the game to me was the play of Sean Lee. His two interceptions were game changers and he was all over the field making tackles. His development has been a little slow but he stepped up when the defense needed him the most with Brooking hobbled by a sprained foot. Now that Lee has finally established himself on defense he needs to stay healthy a put a few good games together to prove to the team that he can be counted on as a long term answer on defense. Peyton Manning did throw for 365 yards but the secondary did a pretty good job throughout the game considering that Manning threw the ball 48 times. You can take a guy throwing for 365 yards if you can get four interceptions and return two for touchdowns against him. Mike Jenkins did get beat for a touchdown but he played pretty well overall. He contested most of the throws to Reggie Wayne and he made the biggest play of the game when he tipped the pass to Sean Lee in overtime. Reggie Wayne did pile up some pretty impressive stats against Jenkins, but it wasn't like Jenkins was getting burned all over the field. Orlando Scandrick made a great play to intercept a pass and return it for a touchdown early in the game but he missed the second half of the game after suffering a concussion. Even Alan Ball did a nice job intercepting a deep pass intended for Reggie Wayne. The run defense was very good but I think part of that was due to the poor offensive line play of the Colts offense. Holding an offense to under 50 rushing yards impressive regardless of the circumstances though. You have to give them credit for stuffing the run enough that the Colts gave up on it. On offense the Cowboys were inconsistent just as they have been with Kitna running the offense. But you have to give Kitna credit for making the plays that had to be made to win the game. The touchdown pass to Witten late in the game appeared to be his third read on the play and he made a great throw to keep the ball away from the defender trailing Witten. The pass to Roy Williams for the two point conversion was huge as well. The running game was great during the first quarter and on the drive for the lead in the fourth quarter. You have to be impressed by the play of Tashard Choice now that he finally got his shot to play this year. But keep in mind he does have fresh legs compared to the rest of the guys out there so hopefully this game isn't a mirage like Julius Jones' second half of his rookie season. You have to wonder if Marion Barber has played his last down as a Dallas Cowboy after watching Choice rack up over 100 yards. The special teams won the game but almost lost it at the same time. The Colts blocked a punt a recovered it for a touchdown in the 4th quarter. Four weeks ago this team would have folded. But Buehler made the big kick to win the game in overtime. He was 3 for 4 for the day. And you have to give Buehler credit for hitting the pressure kick with the game on the line. He has a long way to go if he wants to come back as the kicker next season but he is improving. A win is always nice but it was bittersweet on many levels. Dez Bryant is out for the year after breaking his ankle on a kick return. And even winning 3 out of the last 4 games has only improved the Cowboys record to a less embarrassing 4-8. And really 4-8 is still horrible but a huge improvement after a 1-7 start. But even with a 4-8 record the world just seems like a better place when the Cowboys win. Coming off of a strong performance against the Saints on Thanksgiving day the Dallas Cowboys are actually being given a good shot to pull off the upset this week against the Colts. We've seen this team beat the Peyton Manning led Colts before but it seems like a lifetime ago that the Cowboys beat the undefeated Colts 21-14 in 2006. The Cowboys won't have Romo to run the offense this time around but the roster still has many of the same key components in place. So what will it take to beat the Colts? The Colts aren't 9-0 like they were the last time the Cowboys faced them in 2006. But they still have Peyton Manning even if their record has slipped to 6-5. And the Colts have backed themselves into a corner by dropping two straight games to fall into a first place tie with the Jacksonville Jaguars. It is hard to imaging Manning having a third straight poor performance. The Cowboys will have to find a way to limit Manning's impact on the game. Here is what I think the Cowboys will need to do to beat the Colts. 1. Get off to a good start. Last week might have been a moral victory because the Cowboys refused to give up after quickly falling behind 17-0 against the Saints. Coming from behind is never easy and the Cowboys don't need to get in the habit of starting off slow. 2. Run the ball effectively. It looks like Marion Barber will be out with a calf injury so Tashard Choice should finally see the playing time he has been hoping for. And getting Choice on the field might help the running game considering how ineffective Barber has been all season. Felix Jones and Tashard Choice need to grind out first downs so the Cowboys can control the clock and keep Manning off the field. 3. Pressure Peyton Manning. The struggles that Manning has had over the last few games have primarily been due to pass rushers getting in his face early and often. Just like last week Anthony Spencer could be the difference maker in the game if he can finally break out of his season long slump. 4. Don't turn the ball over. It is cliche to say it but just look back to last week for evidence of what happens when you turn the ball over. Jon Kitna's early interception put the Cowboys in a hole that they had to spend nearly the entire game digging out of. And do I really need to mention how costly Roy Williams' fumble was? 5. Keep Dwight Freeney and Robert Mathis away from Kitna. Part of this can be accomplished by keeping the defense honest with an effective run game. But Doug Free and Marc Colombo need to be at the top of their game this week to neutralize the pass rush of Freeney and Mathis. 6. Exploit the Colts cover 2 defense. This should be a big game for Jason Witten since the middle of the field is usually open against the cover 2. Kitna needs to work the middle of the field to force the Colts' safeties to come closer to the line of scrimmage to help stop Witten. That would open up the offense by freeing up Dez Bryant or Miles Austin on a deep route. 7. Be patient and consistent on offense. The Colts will force the Cowboys to march down the field on short and intermediate length plays. The Cowboys need to avoid penalties and negative plays to move the ball. If the Cowboys can move the ball early the Colts will be forced to adjust their defensive game plan which, again, will open up the field for the big play. 8. Don't allow Manning to beat you on big plays. The Cowboys did a good job for the most part last week against Drew Brees by forcing him to keep his throws underneath. But they gave up a huge play late in the game which turned out to be the difference in the game. Alan Ball and Gerald Sensabaugh need to be aggressive but smart against the pass. They can't let Reggie Wayne run free on the deep ball. 9. Stifle the Colts' running game. If the Cowboys can stuff the run early in the game the Indy offense will become one-dimensional. The Colts don't mind passing on every down if the run isn't working. If Ware and Spencer are free to get after Manning on every play they are sure to make some game changing plays during the game. 10. Make plays on special teams. The fumble that Reggie Bush gave up last week against the Saints was nearly the game winner for the Cowboys. The Cowboys need a big turnover or a big return at some point in the game to help out the offense. If the Cowboys can achieve even half of these goals I believe they can win the game and actually win the game comfortably. I think Jason Garrett is just getting the momentum started and his resume will continue to grow with this game. I predict a 30-20 victory for the Cowboys.